Maganda Panda: Dark circles anyone? This is my go-to product for dark circles. Being a college student, sleepless nights are pretty much unavoidable sometimes. 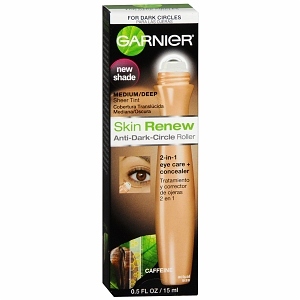 The Garnier anti-dark circle roller has made dark circles a thing of the past for me AND to make it better - it's a drugstore product! Who says you need expensive creams and tons of concealer to rid your under eye mishaps? I started using this in the middle of the summer, and haven't stopped since. Better yet, a little goes a long way. All you have to do is roll it on and dab to blend it using your finger or a brush. The change is practically instant and it's sheer so it doesn't look like you caked on some makeup. The downside is that it comes only in one shade and it's pretty light. I have tan skin (NC30 in MAC, or "Tan" in Pur Minerals) and it works well with me because it's sheer and blends perfectly but I think if you're darker it won't match the skin tone correctly. You always want to aim for a slightly lighter color when targeting your dark circles because well, it needs to be lighted up more than the rest of your skin. That's why this color works perfect for me. Some other perks are that it has caffeine (wakes your eyes up), lemon essence (brightens the area), and minerals (treats). I love this product and I don't see myself switching anytime soon. Has anyone else tried this? What are your thoughts? **Disclaimer** I am not getting paid or sponsored to review this product. I bought this with my own money and these are my honest opinions.